He grew up to become a celebrated actor. But inside he hid another person. An adopted boy who did not know who he was. This is the story of Michael Nyqvist's search for his own story. They stopped in front of the door of the big house. Gerd and Åke longed for a child and after careful investigations that had shown that they looked like parents, a child was waiting for them inside the door. But they did not know who it was, yet. They stood on the stairs to St. Göran's orphanage in Stockholm and it was quite late in the fall. Therein the children lay in small beds. They were mostly girls and they were often the most popular. But instead Gerd and Åke Nyqvist stopped in front of a bed where there was a small and very cute boy with dark hair and blue eyes. His hand cradled a red ketchup bottle. It was the boy's only toy. He was the one who had been in the nursery for the longest time, and he was quiet and watched Gerd and Åke with his big eyes. There was no doubt that he was just the boy they really wanted. Now he would accompany them to the home of the lawyer and his wife in a Lidingö apartment. Now he would have a new and better life. He was named Rolf Åke Michael on Wednesday, November 8, 1961. Michael became his name. Without knowing that his father was not Swedish, he came from a country where you could spell Mikael with "ch". Adoptions were still quite sensitive at this time so it was not mentioned though it must have been mysterious to those who knew the family because no one had seen Gerd pregnant. Michael had a safe upbringing and the family would hardly be called rich even though they lived in "rich" Lidingö. But Åke Nyqvist's job as a lawyer paid enough to put at least some gold in his life. They made trips by car, often big American cars, which Åke proudly steered to the mountains and around Sweden, but also abroad. One of these travels was to change Michael's life forever. In the book "När barnet lagt sig", which Michael Nyqvist wrote and published in 2009, he explains in detail about the trip. And that's a moving story, just like the whole book is. He tells how they go in a big Ford V8 and how daddy drives for 210km on the autobahn while Michael sings. The journey is through Germany since they went there via the ferry between Trelleborg and Sassnitz. The goal is Venice, a long journey, and when they arrive, they check into a hotel with a large balcony and a view of the water. They walk around town and Michael remembers a square with a dining room with a big umbrella with the text "Cinzano" on it. "I can drink Coca-Cola and Pepsi that I have never been allowed to drink at home and I find myself fast in luxury," Michael writes in the book. There is a reason why the family is in Italy and there is a reason why mom and dad are so extra nice. They are sitting in a cafe on a roof terrace and Dad Åke smokes, despite being in the morning, and he never smoked, and there is something in the air, something nervous, something worrying. They are silent and the one who breaks the silence is Mommy Gerd. "I'm your mother, but not your real mom," she says straight out. "Your real mom, who had you in her stomach is not me, but I'm your real mom." It sounds confusing to anyone and how it sounds to a six year old is probably even more difficult to imagine. "You were born in a orphanage," continues the mother with trembling voice. "Your mother was young and could not have you. But when we got you, it was the most beautiful day of our life. You came completely naked with just an empty ketchup bottle. It was your only toy. When we drove you from the orphanage, I asked your dad to drive carefully and the dad replied that you were the most expensive thing he ever drove. This is how Michael Nyqvist describes the dramatic moments in his book, and also told in a summer program on the radio and in several interviews. He learns that his true father is Italian, but not more. He has difficulty retrieving what has just been said, but it will characterize his entire life. On their way back home to Sweden, Michael promises not to tell anyone that he has been adopted. No easy promise to hold, especially when you're only six years old. 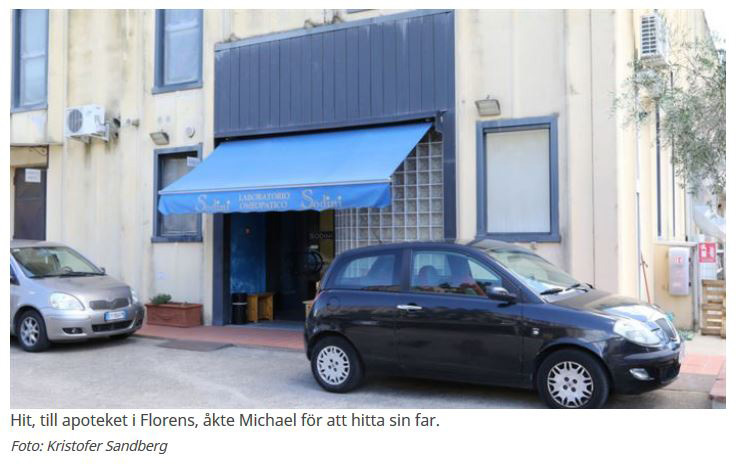 At home, Michael tells what happened to his best friend at Kolmårdsvägen in Lidingö. But the friend does not want to believe what he hears. When the boys come in to eat, Michael tries to tell his friend's mom. He cannot help it. She rejects him too, thinking he's just kidding. She laughs at him. When his mother comes to pick up Michael, he makes another attempt and says, "Mom, you have to tell me what you said in Italy, that I'm adopted and that my dad is from Italy. Tell it to them." But the mother pretends to be amazed, saying, "I do not understand what you're talking about." On the way home, his mother reminds him that it's a secret. Åke and Gerd divorce a few years after they adopt Michael. Michael then lives with his mother in Lidingö, while his dad moves to another apartment in Stockholm. But he sees him every other Sunday. On one of these occasions the mood is a bit special. Michael writes in his book how his father confirms to him that it will be harder to hear from him in the future. Michael tries to convince him to keep calling, and above all, to stay with him. "You said parents who adopt love the children even more than other parents because they cannot have their own children," he says. The father says that's correct, but he still has to go. He walks into the snow and gets in the car, Michael will soon be ten years old and he runs forward to the car in his socks. He sees the tail light. He reaches the tailgate and sees his father's neck and at the same moment the car makes a rush start and disappears. "My cry can hardly squeeze through the cramp I have in my throat. I hear my voice far away and it sounds like when a fox screams," writes Michael Nyqvist in his book. "I immediately understood that he would not turn the car around, that he would not come back to me. It was like I died... I took it as an incredible betrayal and tried to get my dad back all my life. I saw him just a few days before he died. In several interviews, he has told of the two biggest events in his life, about the news that he was adopted and the day his father disappeared in the car. The third major event occurred in 1990. Michael was 30 years old and had become a father himself. Ellen was born on June 10, 1990 and just three months earlier, Michael had married her first wife, Pinita. Michael had become an actor at this time and had some minor roles. But what happened on the day Ellen came into the world was that Michael's thoughts on his own past were revived. That's when he realized that nobody remembered something from their own first year of life. He knew that his biological mother was Swedish and he had found adoption papers from the Social Council, where it says "well-founded boy child" and "mother convinced of adoption". He also found her former name. Through the tax authority, he managed, on the pretext that he was checking if a customer has made payments, he found her current name and residential address. She was born in 1941 and lived at Arbetargatan at Kungsholmen in Stockholm and even got a phone number. "I called and I wrote letters, but she did not want to meet me. 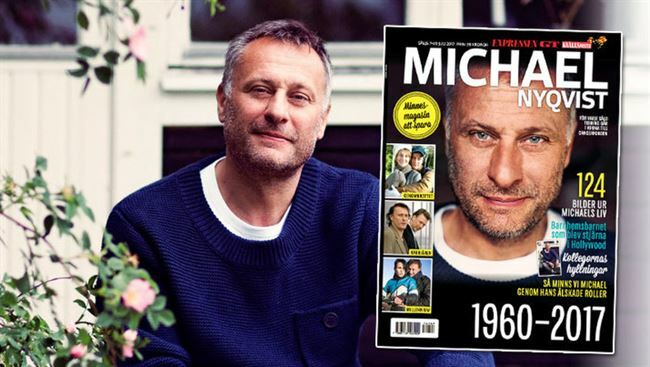 I thought it was incomprehensible," he says in the close-up SVT documentary "Michael Nyqvist - A Portrait" by Susanne Cederberg. A year later he decided to try again. He realized that the beginning of the letter was very, very important. Somebody needed someone to make sure she did not just throw it away. "I want to thank you for being there," he wrote. In the rest of the letter, he describes, according to his own book, that he grows up with adoptive parents, that he has a daughter and that he now wants to meet his mother and get the name of his biological father. "Then I'll go away," he wrote. It takes some time, but then a letter comes and Michael realizes it's from his biological mother. She writes that the meaning of the beginning of Michael's letter, "I want to thank you for being there," prompted her to change and attend a meeting. She suggests they meet, but only in a month and then at a cafe next to the swimming pool at Medborgarplatsen. When the day arrives, Michael is there in good time. He walks around, but sees no one who could be his mother. Suddenly she appears. "Hi, you're Michael, I understand," says a woman. For the first time he sees his mother, the woman who bore him 30 years earlier, and he finds that she is similar to his adoptive mother. "You look like your daddy," she says. They enter the cafe and settle down. Another man comes in. He has a briefcase and he seems to be drunk. The man orders a beer and sits a bit away from them. She tells him they met in Paris in 1958 when he was there for study. He studied chemistry and eventually they agreed that Marcello would go to Sweden and continue his studies there. They moved to Stockholm but Marcello was not allowed to study in Sweden. Instead, he started working as a dishwasher to collect money. Among other things, he worked at the Grand Hôtel. But he did not feel very welcomed in Sweden. He moved home to Italy, but it is unclear if he knew Michael's future mother was pregnant. Anyway, he was gone when Michael was born in November 1960. For almost an hour and a half, Michael and his mother have been sitting and talking when the drunk man comes to their table. Michael is surprised. But then the man tells him that he is married to Michael's biological mother and so he says something very important and explains a lot to Michael. "It was me who took you away," he says. "Forgive me, can you forgive me?" Then he begins to cry. Michael says goodbye to his mother and leaves. In his pocket he has the name of his dad. Now the next detective work begins. In an interview with Aftonbladet, Michael Nyqvist says later that it was his mother's biological mother who demanded she leave her newborn son at the children's home. He has the name, knows that he studied chemistry in Paris and has lived in Casablanca but is an Italian citizen. Through the Italian consulate in Casablanca, he gets help. The name is relatively unusual and Michael begins to search via European number information. He gets phone numbers in Belgium, Italian Turin and Moroccan Casablanca. But it leads to nothing. Michael is prepared to take almost any action to achieve his goal. Finally he calls the Italian Consulate in Casablanca and says he is looking for his biological father. But then he lies. He says he has a serious blood disease and must know if it is hereditary and therefore needs to get in touch with his father, Marcello Lo Cicero. "I do not know what that means," he writes in his book. But it was silent in the handset for half a second. And another official took the handset. Michael was asked to fax the first page of his passport which he did immediately. And just as fast came the answer. It states that Marcello lived in Casablanca until 1971 and that he's married and has two children. The family moved to Florence in Italy and he is a pharmacist. When Michael is over 35, he leaves for Italy. He has booked a hotel in Florence for a week and the goal is to meet his father. He now knows that he lives in Florence and Michael has found out which pharmacy he operates and where he lives. The pharmacy is located on Via Sodini, a fairly small street. It's a nervous 35-year-old standing there smoking cigarette on cigarette and drinking a double espresso and just waiting for the right moment to step in to meet his dad. And then he approaches the pharmacy, he steps in and there's a man in his 60's, but Michael quickly finds that it cannot be him. Behind another counter is a younger woman in her 30s and has blonde hair. Michael goes to her and asks for Marcello Lo Cicero. The woman laughs and says that he has traveled on holiday to Ireland and he is not coming home until two weeks. A disappointment spreads in Michael. He has booked the hotel for a whole week and he is not there. He leaves a letter for the young woman saying that it's very important that she gives it to Marcello. She promises to perform the assignment. During the week in Florence, Michael succeeds in looking for the house where his dad lives and he photographs the house. He goes to the pharmacy almost every day that week and buys a few different things every time. An early morning a couple of weeks later, the phone rings in Michael's family summerhouse in the Stockholm archipelago. Michael, who divorced his daughter Ellen's mother in 1994, has met another woman, Catharina, nine years younger than himself. They have a son, Arthur, born in 1996, and they will marry two years later. The phone call is for Michael. And it's his dad calling. That's Marcello. "E ti Padre, come stai? Says the voice in the handset. (in Swedish: It's your dad, how are you?). Michael's Italian is not so good so he switches to French. He realizes immediately that his dad is happy to have received his letter and it is a relief. "Do you know who you gave the letter to what you left at the pharmacy," says Marcello. It was your sister, Beatrice. "Now I do not let you go, now you will not let me go." They keep in touch and it is decided that they will meet in Sweden in Stockholm and the place will be Medborgarplatsen. Marcello wants to stay at the hotel Malmen. They decide on a time to see each other but Marcello does not show up. Michael goes and gets a beer and another. He sits in the hotel's foyer and time goes by. After four hours, a man in yellow camel-hunters arrives through the glass doors. He has brown shoes, a suitcase in light leather in his hand and his gray hair is stretched backwards. Michael describes him in his book as elegant and stylish. "It's my dad," he writes. "In one second, I'll recognize him, though I have never seen him." When they greet each other, Michael finds that they have the same hands, father and son. In the evening they leave from Södermalm to Djurgården where they will eat at Ulla Winbladh restaurant in Djurgården where Michael booked a table. As they pass the Grand Hôtel, Marcello says that he once worked there as a dishwasher when he was with Michael's mom. He also reveals that he never knew what happened to Michael, that he did not know that his son was adopted. In addition, he tells Michael that his family is from Sicily, that his grandfather had a cargo where they cultivated wine called Lo Cicero. And so he said that most people living in northern Sicily have blue eyes and that Michael's eyes are similar to his grandmother's. Marcello also tells Michael, that he has two siblings, Beatrice, whom he had already met at the pharmacy, and Fabricio, who lives in Paris. Michaels and his father's families meet more often in the years to come. The family also gets together when Michael's sister Beatrice gets married. In 2001, Michael's adoptive father, Åke, becomes ill with a blood disease. He makes contact with him during the illness. One day at the end of 2001, he flew to Stockholm and when he landed at Arlanda, his mother called and told him to go to the hospital immediately. His father was weak. Michael sat with him when he died on lucia day 2001. He was 77 years old. Michael had not visited his father's apartment often. Their contact had been bad for many years, almost all of his life, and Michael did not think that Åke cared for him. But he decided to visit the apartment to begin sorting and cleaning. He found that it was a dwelling for a lonely man. He describes in his book how he opened boxes and lifted newspapers on the bedside table that contained many medicine bottles. He suddenly remembered how he had a theater premiere right next to his dad's home once and that Åke had been there for a while and that the reviews afterwards were brilliant, but that Åke did not say a word about it. Michael found a closet full of beer cans, but in the closet next door he saw something he did not expect. Here's what he wrote"
"I open the closet in the middle and find that it's full of magazines and clippings. Some of the newspapers are from the resort. It's all about me. He has highlighted reviews and interviews with yellow marker pens. He has every theater program I've been in. Every image taken ". Above all, Michael Nyqvist found his roots. He knew why he was abandoned and he knew who his biological mom and dad were. The meeting with Marcello was the beginning of a warm and cordial relationship. Michaels family traveled back and forth to Florence to see Marcello and his family in Italy. He had a good life thanks to his adoptive parents. But they had also caused him a great deal of pain, especially for so many years when he had to conceal that he had been adopted. But there is always something good in everything that hurts. He also shows great gratitude to his adoptive parents, despite what happened. In a summer radio program, he ended with "I want to dedicate this program to my mother. Mommy Gerd, thank you for putting up with all my impossible questions over the years, because I know they were almost impossible to answer. Thank you for being there."